The garage is often a forgotten part of the home. It’s a space for power tools and messy storage, but it doesn’t have to be. Painting the garage is a popular option for homeowners who want to make their garage more of a usable space and less of an eyesore. 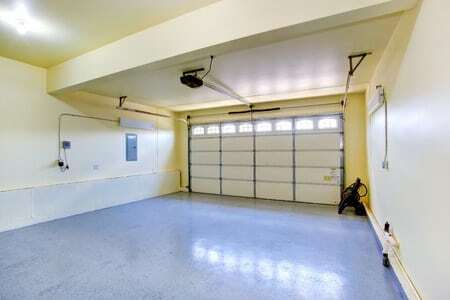 A little paint and a little TLC transforms your garage space from an afterthought to the intentional square footage. Painting the garage is a relatively easy process, but must be done correctly to create the effect that you are looking for. 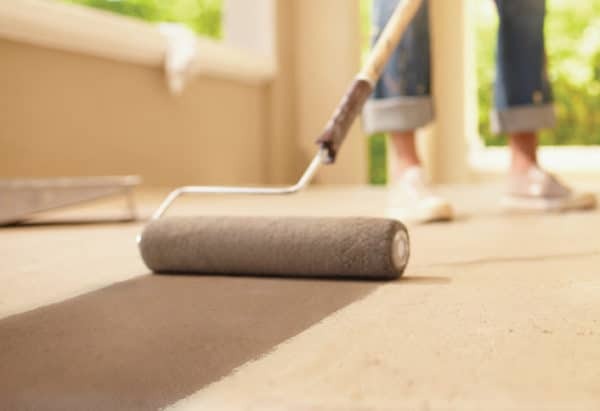 If you’re considering painting your garage, avoid these common mistakes to ensure your finished product is durable and beautiful. 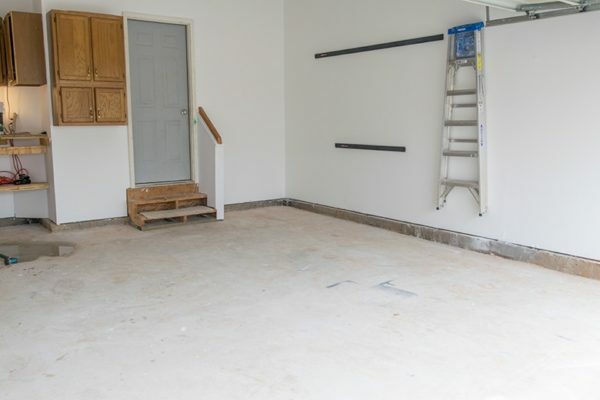 No, you cannot use leftover paint from finishing your basement to paint the garage. The climate in your garage are different than the climate in your house. You must use exterior paint when painting a garage. Even though your garage has no direct exposure, it is much more vulnerable to wet/heat/cold than your interior space. Exterior paint is thicker and tougher and mildew resistant, so it gives a more durable finish to the garage. Such as this floor paint , you can find on Amazon. You need to take the time to prep. I know you don’t want to, neither do I. Prepping isn’t fun, but it’s always worth it. Taking everything out the garage is more than just moving out the cars. Taking out all the stuff stored in there. You also need to remove electrical outlets and switch covers, fill holes, and apply tape to every fixed object. You need to seal all cracks and seams to ensure the finished product adheres correctly. This is a weekend job- not a one day job, but nothing you can’t handle. Real talk. This is the worst part of painting the garage. If you’re one of those people who loves to get down and dirty scrubbing out the crevices of their garage I don’t understand you. As for the rest of us, this is the necessary evil of painting your garage. You have to clean your garage. I mean really. I’m talking about the baseboards, cobwebs, walls, floors, everything. The goal is to get that garage as clean as possible. Sweep, spray and scrub every inch before you start painting, and use a degreaser if necessary. Once you have swept and think it is clean, use a pressure washer to get the job fully cleaned. If you do this, you MUST allow your concrete to dry thoroughly. I’ll get in detail later about this. If you skip the cleaning, your paint will inevitably crack and peel. Don’t try to save time by rushing the job. 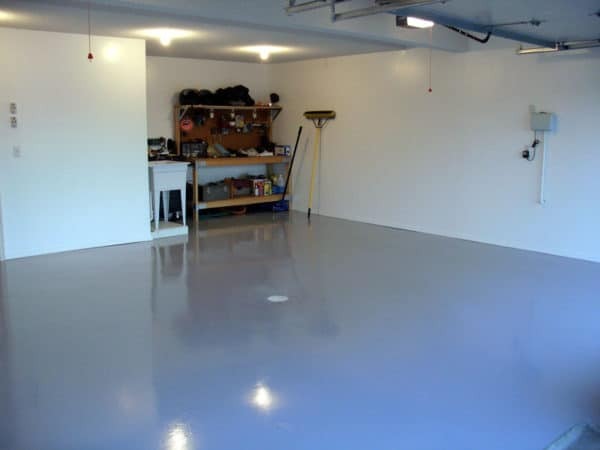 Painting the walls of your garage can create a more usable, clean space but don’t forget about the floor. Painting your garage floor can help keep the space clean and polished and create a more finished look. Without painting the floor, the project looks unfinished. Before you start painting, you need to conduct a moisture test. This is especially important if you plan on painting the floor. You can’t always see the moisture your garage is collecting, so a moisture test ensures your paint will bond correctly. Tear off a few feet of clear plastic wrap, lay it on the floor and use Duck Tape to seal all of the edges. Leave it for a day or two and check inside for moisture. If your concrete has moisture, you will need to apply a moisture or vapor barrier, which is an epoxy primer (you can find this at your local hardware store). Apply this to your flooring and allow to dry before painting or sealing. Once you’ve got the right paint and you’ve prepped, cleaned, and tested your space, you are ready to paint. Painting the garage is a similar process to painting any other wall. Always start with the walls and let them dry completely. Do a quick re sweep one more time before finishing the floor and enjoying your new space. Don’t forget to purchase a roller extension pole. This simple tool will save your back! Ready to start painting? Check out the step by step tutorial: How to Paint Your Garage Floor or do you need more ideas to inspire? Garage Makeovers to Inspire! Comment below any garage plans you have! What do you do if the plastic is wet underneath? Toni- If your concrete has moisture, you will need to apply a moisture or vapor barrier, which is an epoxy primer (you can find this at your local hardware store). Apply this to your flooring and allow to dry before painting or sealing. This traps in any vapors to protect your paint. Good luck on your garage!